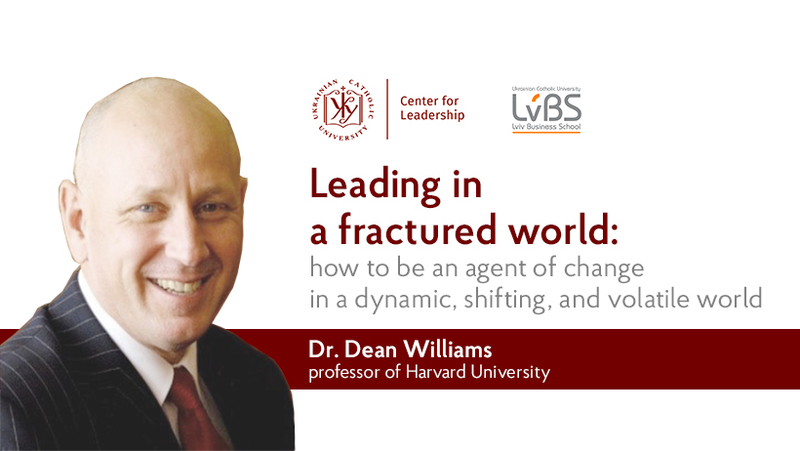 UCU Center for Leadership and the Lviv Business School (LvBS) will host Harvard University professors, a global expert on leadership and change management, Dr. Dean Williams. On February 21th, he will give the only open lecture in Lviv for business, government representatives and the non-government sector. On 17-24th of February, Professor of Harvard University Dr. Dean Williams will be in Ukraine. He arrives at the invitation of the UCU Center for Leadership and Lviv Business School (LvBS) and will take part in a number of events in Kyiv and Lviv; meetings will be held with the support of the UCU School of Public Management and the UCU Analytical Center. Mr. Williams served as a faculty member at Harvard University since 1999, based at the Harvard Kennedy School’s Center for Public Leadership. Dean has consulted, lectured, or led workshops all over the world. He served for five years as the Chief Adviser to the President of Madagascar, leading one of the most innovative development reforms in Africa. He has also led major change processes, facilitated leadership development initiatives, and/or conducted extensive research with companies, governments, educational systems in the United States, India, Australia, Nigeria, Singapore, East Timor, Japan, Colombia, Cambodia, Europe, the Middle East, and Myanmar. In Ukraine, Dean Williams will meet with representatives of business, government agencies and the private sector, who are leaders of change in their fields. He will also teach as part of the curriculum of the UCU Center for Leadership for Political Parties “Good leaders for good governance”, and will meet with students of the Ukrainian Catholic University and young people from the Ukrainian Academy of Leadership. We invite you to attend an open meeting with Dean Williams on February 21th at 6:30 pm in a classroom at Sophia Church ( Kozelnitskaya Street, 4, UCU campus, between the Sheptytsky Center and the UCU Academic Building. The lecture will be held in English without translation. Contact person: Ярина Степанюк (Yaryna Stepanyuk), ystepanyuk@lvbs.com.ua, 093 99 555 32. Originally from Australia, served as a faculty member at Harvard University since 1999, based at the Harvard Kennedy School’s Center for Public Leadership. In recognition of his teaching he has regularly received “the most influential course award,” and was also a recipient of the University’s prestigious Carballo Award for teaching excellence. He has also served as a visiting professor at the Lee Kuan Yew School of Public Policy in Singapore, and for ten years has led the popular Social Leadership Singapore program. Today, Dean recently left full-time teaching and now runs his own leadership research and consulting firm, THINKING HEADS GLOBAL. Dean has consulted, lectured, or led workshops all over the world. He served for five years as the Chief Adviser to the President of Madagascar, leading one of the most innovative development reforms in Africa. He has also led major change processes, facilitated leadership development initiatives, and/or conducted extensive research with companies, governments, educational systems in the United States, India, Australia, Nigeria, Singapore, East Timor, Japan, Colombia, Cambodia, Europe, the Middle East, and Myanmar. He earned both Master’s and Doctoral degrees from Harvard, specializing in leadership studies and organizational development. He conducted extensive research with Aetna Life and Casualty in the United States, with the Matsushita School in Japan, and with the Government of Brunei in South East Asia. While living in Borneo, Dean studied adaptation and change with indigenous tribes. In his younger years he was a factory worker at Ford Motor Company and an executive with the State Electricity Commission of Victoria. He continues to work with businesses, governments, and institutions around the world on building leadership capacity to respond to the demands of leading in a complex world.